Bored of drinking regular water ? Need something tasty and yet not load on the calories? Try this amazingly cooling tender coconut mocktail to quench your thirst ! 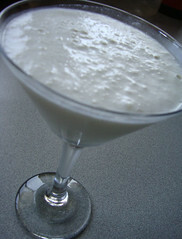 In a blender, mix the tender coconut cream, coconut water, cardamom, rose water and honey. Serve cold with ice and enjoy the benefits of coconut water ! « How to Gain weight ?